The region is far west of the hemisphere NASA’s New Horizons spacecraft viewed during close approach last summer. The upper image – in black and white – sports several dozen “haloed” craters. The largest crater, at bottom-right, measures about 30 miles (50 kilometers) across. The craters’ bright walls and rims stand out from their dark floors and surrounding terrain, creating the “halo” effect. 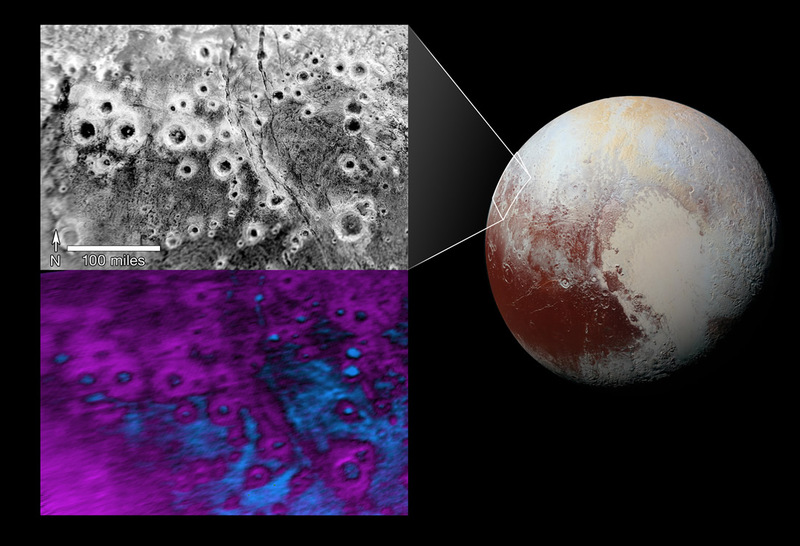 In the lower image, composition data from New Horizons’ Ralph/Linear Etalon Imaging Spectral Array (LEISA) indicate a connection between the bright halos and distribution of methane ice, shown in false color as purple. The floors and terrain between craters show signs of water ice, colored in blue. Exactly why the bright methane ice settles on these crater rims and walls is a mystery; also puzzling is why this same effect doesn’t occur broadly across Pluto. The upper view is a mosaic made from two separate images obtained by New Horizons’ Long Range Reconnaissance Imager (LORRI). A high-resolution strip taken at approximately 760 feet (232 meters) per pixel is overlain on a broader, low-resolution image taken at 2,910 feet (889 meters) per pixel. The images were obtained at ranges of 28,800 miles (46,400 kilometers) and 106,700 miles (171,700 kilometers) from Pluto, respectively, on July 14, 2015. The LEISA data came the same day, during the instrument’s highest-resolution scan of Pluto, with New Horizons 28,000 miles (45,500 kilometers) from Pluto, with a resolution of 1.7 miles (2.7 kilometers) per pixel.